MORE Negative Changes Coming to Plastiq? Update: Frequent Miler confirmed that Plastiq no longer accepts AMEX cards for mortgage payments. 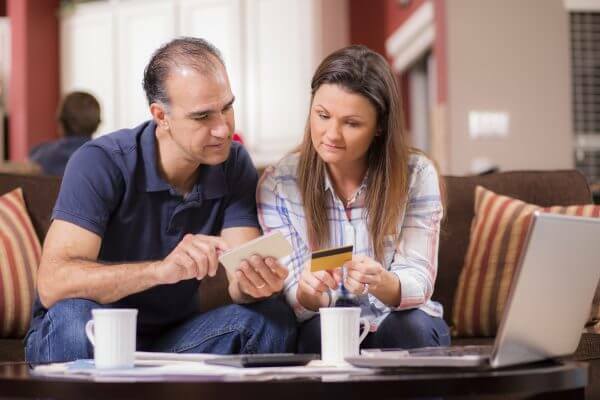 Although existing, scheduled mortgage payments with an AMEX card are still going through. There could be more bad news for those of y’all who use Plastiq to meet minimum spending requirements and earn extra rewards. Earlier this year, Plastiq removed the ability for folks to use Visa credit cards for mortgage payments. And according to a tweet from YS.E.H, now folks trying to use American Express credit cards for mortgage payments through Plastiq are being declined. Plastiq Already Made It More Difficult to Use Their Services to Earn Valuable Sign-Up Bonuses With Visa Cards. Are They Doing the Same With AMEX? Is Plastic Blocking Mortgage Payments Made With American Express Cards? Plastiq is a service that allows you to pay any bill (businesses or individuals) with a credit card. That includes bills that do NOT accept credit cards, like mortgages, rent, and car payments. Folks in the miles & points hobby like Plastiq because it’s an easy way to help meet minimum spending requirements. But because Plastiq usually charges a 2.5% fee for their services, it’s usually NOT a good idea to use the service just to earn extra miles & points. Now, some folks are reporting that American Express credit cards are no longer working for mortgage payments. Team member Harlan has a few mortgages payees that he handles through Plastiq. And he confirmed that one of his payees could no longer be paid with an AMEX card. But the others still worked! At the moment, this seems like a very case-by-case restriction. 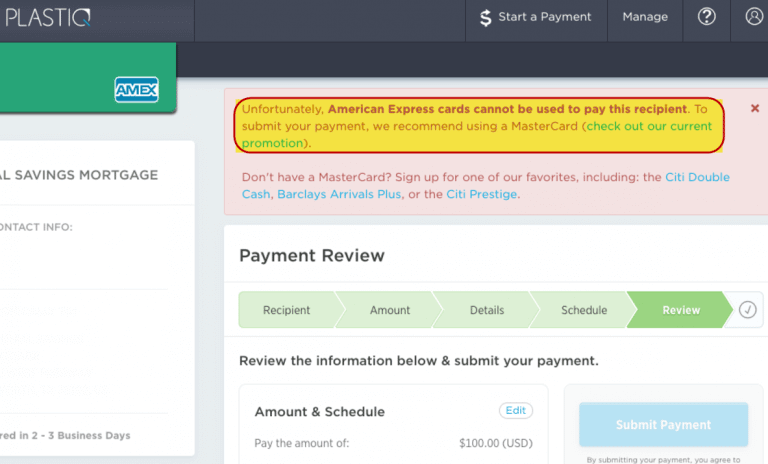 We don’t know if Plastiq will continue to reduce AMEX-eligible payees. But it’s worth signing into your account to see if these changes affect you! That said, both MasterCard and Discover still work well for mortgage payments through Plastiq. So if you want to pay your mortgage through Plastiq with a credit card, there are still plenty of options, like the Citi Prestige or Barclaycard Arrival Plus World Elite Mastercard. Note: There is another service similar to Plastiq called Tio (previously called ChargeSmart), which still allows you to pay a mortgage with a Visa card. But NOT AMEX credit cards. Similar to Plastiq’s move with Visa earlier this year, folks are reporting that you can no longer use AMEX cards to make mortgage payments to certain payees. If you pay your mortgage with an AMEX card, I recommend checking your account to see if your payees are affected. So you can come up with a backup plan! Does this unannounced change from Plastiq affect you? Isn’t Tio now owned by PayPal??? As of right now, Tio doesn’t and won’t accept AMEX. Are you sure about that? AMEX doesn’t work for me either in Tio. And I spoke with a Plastiq rep on chat today, and he said AMEX had asked them to stop allowing AMEX payments for mortgages, same as VISA. Hmm, thanks for your data point. I don’t use Tio, but there’s a very clear American Express logo among all the other card associations, and I’m 100% certain you could pay with AMEX before. I’ll have to look into this! “What card brands does TIO accept? Thanks for clarifying! The post has been updated.